3 Bedroom Semi Detached Cottage For Sale in Diss for Offers Over £400,000. This delightfully secluded cottage is situated within the rural village of Hopton and offers both charm and character in abundance. The property is thought to date back to the early 1800's but has undergone sympathetic refurbishment in the 1970's and extension later whilst retaining the majority of its original features. The vast expanse of the cottage is quite deceptive from the front but offers 1900 sq ft of flexible living space. As you step inside the property you are immediately met with a sense of the vast proportions of the cottage and how light the rooms are. The cottage is heated via oil fired central heating with radiators in all rooms and double glazed wood casement windows. As you walk into each room you are met with an abundance of natural light and well proportioned rooms. The ground floor accommodation is even further enhancing with an impressive vaulted ceiling to the kitchen/diner and two reception rooms. On walking into the living room you are automatically drawn to the stunning Inglenook fireplace with cast iron wood burner. The first floor boasts three large double bedrooms, with en-suite to the master bedroom, with views over the garden and fields to the rear of the cottage. Your first impression of this property is the solid wood casement door which leads you to an entrance hall with tiled flooring, under stairs storage, staircase to gallery style landing. The entrance hall also provides access to kitchen/diner, reception rooms and utility. Having a double aspect floods this living room with natural light. This spacious room benefits from a stunning Inglenook fireplace with open red brickwork and bressumer beam over. The cast iron wood burner is set upon a tiled hearth. 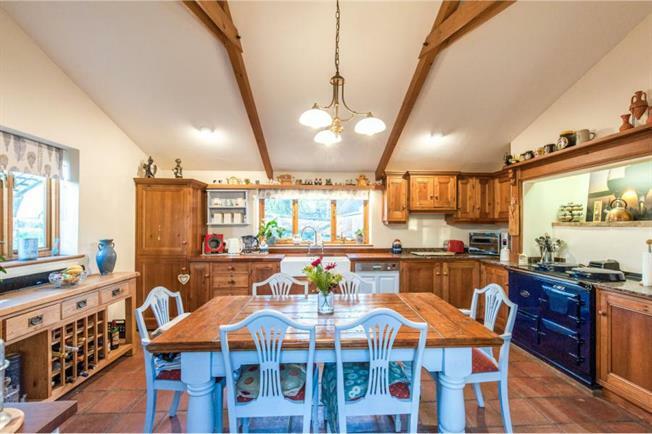 Wow, this stunning double aspect kitchen/diner with impressive vaulted ceiling benefits from an abundance of natural light and has access through to the conservatory. The wooden matching wall and floor units are an excellent addition to this kitchen/diner with their matching wooden and granite worktops. Tiled flooring, traditional blue AGA, inset four ring electric hob, space for dishwasher and traditional butler sink. Access to the rear garden is via a solid wood stable door. Matching floor and wall units with inset sink and drainer, space for a washing machine, oil fired central heating boiler and tiled floor. This spacious conservatory is situated to the rear of the property and sits on a brick base with wood casement double glazed windows. Tiled floor. Double doors opening and leading into the rear garden. Internal door to Living Room. This gallery style landing has built in storage cupboards. Exposed beams and timbers. Pine brace and batten doors provides access to the three bedrooms and the family bathroom. This bright and airy master bedroom benefits from being dual aspect with views to the front and rear of the property. Carpet to floor. Built-in wardrobe and cupboard storage. Access to the en-suite. This double bedroom is situated at the rear of the property with stunning views of the rear garden and fields. Open Beams to ceiling. Carpeted flooring. Built-in wardrobe and cupboard space. The double bedroom is also situated to the rear of the property with stunning views of the rear garden and fields. Beams and opened timber. Carpeted flooring. This family bathroom is not only stunning but luxurious with exposed beams and timbers. The large corner bath with inset LED lighting to base tiling, shower over bath, low level WC and wash hand basin. Tiled flooring. Under floor heating and heated towel rail. Shaving point.